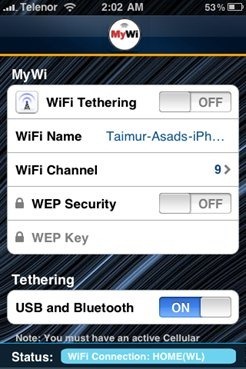 Do you want to tether your Wi-Fi iPad with your iPhone? look no further than MyWi app for jailbroken iPhones which is so much more easier to use than you think it is. With MyWi, you can create a WiFi HotSpot with a press of a finger! 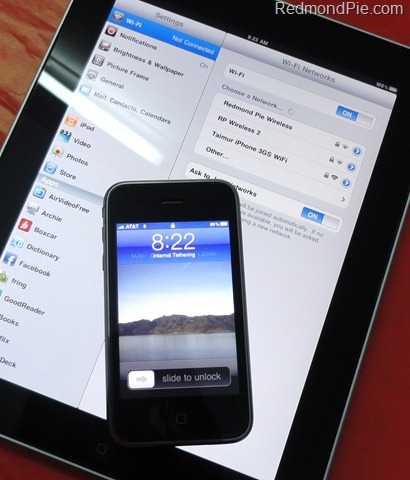 Wherever you are (just like iPad 3G) – you can connect your iPad to your iPhone easily. For installation instructions, simply follow the step by step guide posted here. MyWi is available on both Cydia and Rock and comes for US $9.99 with a free 10 days trial if you download it via Rock. Features of MyWi app are as follows. I am doing this since April 3 jejejejej when i go in the train here in new york the people believe that i have the IPAD 3g but really only use the app MiWifi from my iphone jailbroken jejejeej good tip. Can this run in the background on the iPhone or does it pwn the phone while in use? What happens when a call comes in? A program like this means the difference between waiting (and paying) for the 3g for me so any feedback is GREATLY appreciated!! Mlalahoi – My Wi can run in the background of nay iPhone 1st Gen, 3G, 3GS etc, it's a paid for app in Cydia, once launched and enabled, you can quit the app, as for calls, you can still take calls, and surf the internet at the same time. keep in mind, if you have 3G enabled, and myWi on, and your surfing the net and downloading a lot, expect your bandwidth and battery life to be diminished. Thanks for the reply! This app looks amazing, I also found a video review of the software on AppJudgement that compares it to other solutions…the choice is a no-brainer. Now if they could just add in a function to pass through GPS data from the phone to the iPad there would be ZERO reason to pay for the 3G version. DO NOT MAKE CALL AND USE AT SAME TIME…STUCK ON APPLE BOOT LOGO AND HAVE TO RESTORE ONCE A MONTH!!!!!!!!! I've been wondering if this could be done!!! Now I really don't need that 3G iPad. Ill just tether! People talk smack about Apple, but they are one of the greatest software communities I know of. Theres always something new and useful being done, 99% of it free of charge! I would gladly pay for this! Any problem with Visual Voice Mail using MyWi ? Well, backgrounding, and many of the new features are already available on a jailbroken phone. Above is nonsense. I use it AND make calls at the same time. MyWi is by far the best App I've ever downloaded. What can be easier or more universal than making your iphone a wireless access point. I've tried other programs in the past that required separate software for the computer and an app for the phone that don't work as well as MyWi. I'm using it now to write this comment while on vacation in Uganda Africa while everybody else is struggling with the hostels POS internet. MyWi is the BEST! will att charge you anything to use mywi for internet tethering? Will they tag on any additional charges to do so? Thanks.